Watching SWEET SMELL OF SUCCESS is like taking a slog through a sludge-filled, rat infested sewer. It’s “a cookie full of arsenic”, with two of the most repellant characters to ever worm their way across the silver screen. 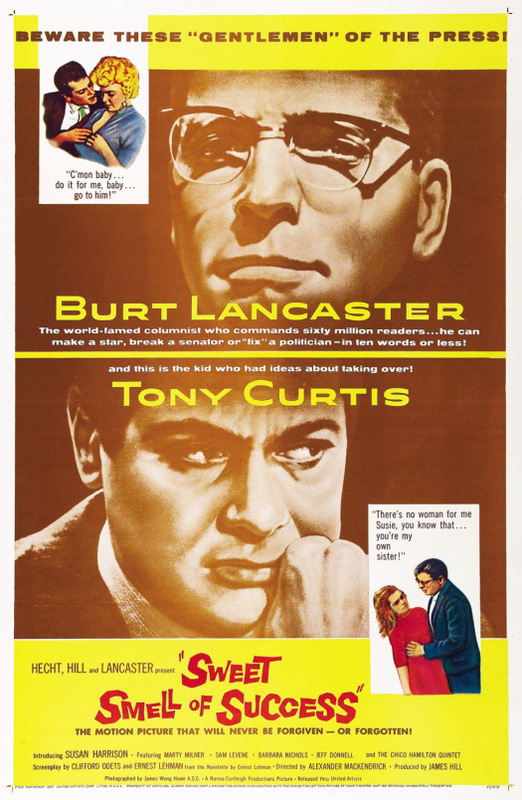 It’s also a brilliant film, with superb performances from stars Burt Lancaster and Tony Curtis, wonderfully quotable dialog by Clifford Odets and Ernest Lehman, tense direction by Alexander Mackendrick, and stunning black and white photography by James Wong Howe . It’s a movie that demands repeated viewings; just make sure to take a shower after each one! This entry was posted in Film, Film Review and tagged Barbara Nichols, Burt Lancaster, Chico Hamilton, Clifford Odets, Cracked Rear Viewer, Elmer Bernstein, Ernest Lehman, film noir, Gary Loggins, James Wong Howe, Martin Milner, Sam Levene, Susan Harrison, Sweet Smell of Success, Through the Shattered Lens, Tony Curtis, United Artists. Bookmark the permalink.